Curating Lab: common programme: Public Symposium "When Does an Exhibition Begin and End?" common programme: Public Symposium "When Does an Exhibition Begin and End?" 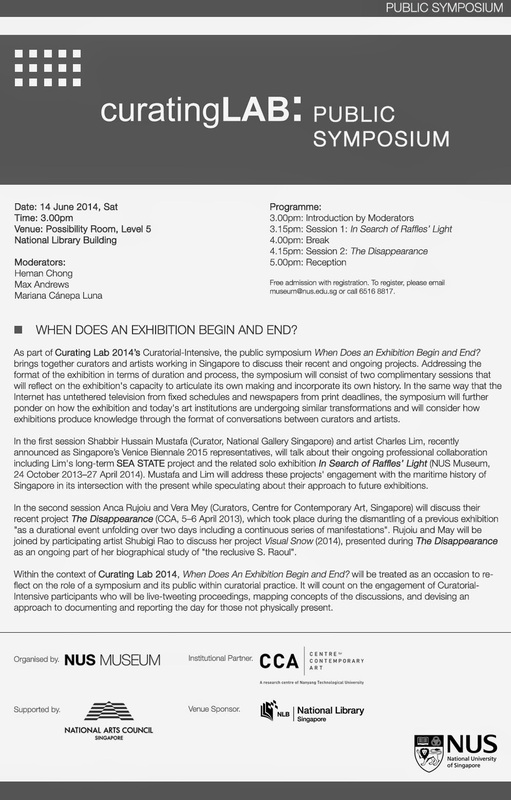 As part of Curating Lab 2014’s curatorial-intensive, the public symposium When Does an Exhibition Begin and End? brings together curators and artists working in Singapore to discuss their recent and ongoing projects. Addressing the format of the exhibition in terms of duration and process, the symposium will consist of two complimentary sessions that will reflect on the exhibition's capacity to articulate its own making and incorporate its own history. In the same way that the Internet has untethered television from fixed schedules and newspapers from print deadlines, the symposium will further ponder on how the exhibition and today's art institutions are undergoing similar transformations and will consider how exhibitions produce knowledge through the format of conversations between curators and artists. In the first session Shabbir Hussain Mustafa (Curator, National Gallery Singapore) and artist Charles Lim, recently announced as Singapore’s Venice Biennale 2015 representatives, will talk about their ongoing professional collaboration including Lim's long-term SEA STATE project and the related solo exhibition In Search of Raffles’ Light (NUS Museum, 24 October 2013–27 April 2014). Mustafa and Lim will address these projects' engagement with the maritime history of Singapore in its intersection with the present while speculating about their approach to future exhibitions. In the second session Anca Rujoiu and Vera Mey (Curators, CCA — Centre for Contemporary Art, Singapore) will discuss their recent project The Disappearance (CCA, 5–6 April 2013), which took place during the dismantling of a previous exhibition "as a durational event unfolding over two days including a continuous series of manifestations". Rujoiu and Mey will be joined by participating artist Shubigi Rao to discuss her project Visual Snow (2014), presented during The Disappearance as an ongoing part of her biographical study of "the reclusive S. Raoul". Within the context of Curating Lab 2014, "When Does An Exhibition Begin and End?" will be treated as an occasion to reflect on the role of a symposium and its public within curatorial practice. It will count on the engagement of Curatorial-Intensive participants who will be live-tweeting proceedings, mapping concepts of the discussions, and devising an approach to documenting and reporting the day for those not physically present. The Symposium will be moderated by artist, curator and writer Heman Chong and Barcelona-based curatorial office Latitudes (Max Andrews and Mariana Cánepa Luna). Free admission with registration. To register, please email museum@nus.edu.sg or call 6516 8817.